Ouch! How to Deal With Back Pain. Ouch! There goes that back again. 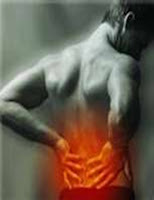 Statistics show that about 80% of people will suffer some sort of back pain in their lives. Personally I think that number is actually much closer to 100% but stats are stats. I get it. Back pain is awful. Every time you move you feel like someone zapped you with 3000 volts. You can’t get comfortable. No good at all. There are some things you can do that may help, though. Today I just want to give you a few things you can do to deal with any back pain you might have and a few ways to keep it to a minimum before it happens. 1. Ice. When you first hurt your back it’s very important to attack the injury with everything you have as soon as possible. The first step is ice. 20 minutes on, 20 minutes off as often as possible. People always have excuses for why they can’t do this. It’s inconvenient, it’s cold and uncomfortable, etc. It’s your back so do what you want, but you’ve got swelling and inflammation and if you want to get out of pain you need to reduce these things. Attacking back pain ASAP is the key to getting rid of it ASAP. Wait on it and it will linger much much longer. 2. Don’t stop!!!!! I’ve seen it many times. Someone’s back goes out and their immediate reaction is to stop doing anything. They sit down and just wait for it to go away. Sure, at the very beginning rest may be appropriate but that’s at the VERY BEGINNING. As soon as you can, it is crucially important to start moving even if all you can manage is a short walk. This is for a few reasons. First, sitting is just horrible for our back. I don’t have the space here to go into all the reasons why, but they are numerous. Second, moving around improves circulation and getting blood flow to injured areas is a very important part of recovery. As a quick example I had a client who injured her back in a fluky way just reaching for something at her house. She felt pretty bad, but she kept at it. She moved around, stretched and did what she could. A week later she hit a personal record on her squat, lifting 220 pounds. I’ve known other people who get a slight twinge and shut it down for weeks or longer and never really get any better. Get going. There is ALWAYS something you can do. 3. Stretch and move your hips and shoulders. Let’s take a quick anatomy lesson. Your low back is not supposed to move much. The main function of this area of your body is stability. The areas of your body that are supposed to move are your hips and shoulders. Due to the fact that most people sit all day, they have very tight hips and shoulders and the low back has to make up for that. This leads to pain, so mobilizing your hips and shoulders is an important step to relieve that tightness and a huge step in preventing back pain in the first place. 4. Deal with it. OK. This is where I have to keep it real just a little bit. Even though back pain can be extremely painful and debilitating, from an injury standpoint, many times it’s not that bad. What do I mean by that? Let me give you an example. When you stub your toe, how bad does it hurt? Quite a bit. Is it a very serious injury? Probably not. So to apply this to our back, because of all the anatomical processes that go on in our low back area, sometimes a minor injury can aggravate a whole host of nerves that can actually bring us a lot of pain. Also, the more we obsess on our pain the more stress we feel. The more stress we feel the more tense we get. The more tense we get, the tighter our back gets. Breathe deep and relax. The key is to go on about our lives with a good attitude (isn’t that always the case) and do the things I mentioned to the best of your ability. Before you know it you’ll feel a whole lot better. Well, the summer is almost upon us. That means warm temperatures and more opportunity to do things outside! One of the most popular outdoor activities is tennis, so today I’d like to talk about some things you can do with your workout program to both improve your game and prevent injuries. The basis of tennis is the ability to get to the ball and hit it over the net. To do this effectively and safely you must work on some important attributes. Keep in mind that everyone has strengths and weaknesses, so what may be a priority for one person may not be for someone else. If you’re not sure what you need to work on, consult a good trainer who can assess you and design an appropriate program for your needs. I know someone who qualifies. 1. Thoracic spine mobility. The thoracic spine, or t-spine for short, is the section of your spine that runs through your mid to upper back. It‘s above your lumbar and below your neck (or cervical). To understand how important it is, let’s do a quick experiment. Stand as tall as you can. Now bring your arms over your head. Pay attention to your arm position here. Stand up again, but this time hunch over just a little. Raise your arms up again. Can you feel the difference in your range of motion? That all resulted from limiting your t-spine mobility, which is what happens when you’re in even a slightly hunched posture. Now try to imagine taking a game’s worth of swings with that limited range of motion. It’s not hard to see a number of shoulder and back injuries resulting. Ouch! A good, basic stretch for this is a chair stretch. Sit in a chair with a solid back that comes to below your shoulder blades. Clasp your hands behind your head and point your elbows forward. Tighten your core keeping your elbows pointed and lean back. Hold the stretch for 5-10 seconds or whatever feels good. You can also do this in a standing position. Just make sure to keep your core and glutes tight in whatever psoition you do it. 2. Core stability.When people think of tennis they think of movement, but even you are swinging in the midst of a full stride you must have good core stability to control your swing enough to get the ball over the net. This is especially true if you want to get it to a specific spot on the court. You see, the true purpose of our core is to provide stability to the rest of our body. Without a stable core you’ll have little or no power or control of the ball. Think of trying to hit the ball with a piece of paper versus a tennis racquet. It’s not going to go anywhere because the paper has no stability. The same thing applies to your body. Not only that, but poor core stability in a sport like tennis can lead to a host of injuries such as muscle pulls due to a lack of bodily control. You can feel in the picture below the stability that is being created in the core. Think of how different the picture would look otherwise. 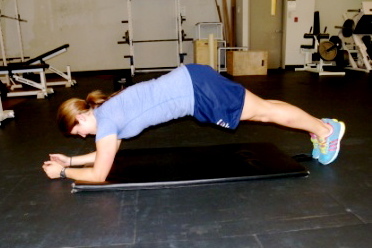 The plank is a great founbdational exercise for core stability training. To perform it, lie face down on the floor resting on your forearms and toes. Keep your glutes and core tight and your hips in a neutral position. Most people compensate here by hiking their hips up to place more emphasis on their arms, or sagging their hips which will place pressure on their lower back. Here’s an example of a bad plank position. Notice the high hips. Below is a good one. Hold it for at least 30-45 seconds. 3. Power. OK. You got the ball over the net. Now what? Well, your opponent is going to hit it back. Once they do, you have less than a second to react. Your first step is going to determine whether you get to the ball and, if you do, whether you’re going to be in a good position to hit it once you get there. All of that comes from power, which is defined basically as how quickly you can produce force. One of the best power exercises is the broad jump. Stand in an athletic position with your hips and arms back. Throw your arms forward and jump as far as you can. Do only one or two in a set and make sure that you completely reset yourself between each jump. You want to work on power with these and if you do too many in a row, you’ll stop working the fast-twitch muscle fibers that produce power. 4. Strength. There are a few different reasons for this one and they might not be what you think. Take a look at the picture below. While it’s true that someone must have good flexibility to get into a position like this, strength is the attribute that will allow us to do something once we get here. After all, our goal isn’t just to be able to get to the ball it’s to be able to do something with it. The other thing that strength will help with is to support our body in this position. Most injuries occur at extreme ranges of motion, so while it’s nice to be able to stretch to this extent, it’s counter-productive if we get hurt once we get there. The main areas we want to focus on here are our upper back, core and hips. The upper back because you need something to balance out all of the stress that can be placed on the shoulders, the core so that we can stabilize our body and hit with power and accuracy and the hips because any power that we produce with our swing truly comes with effective hip rotation. Come to think of it, any power that our body produces usually comes from the hips in one way or another. A great exercise for the upper back is the dumbbell row. Stand tall with a dumbbell in each hand. Push your hips back so that your upper body is at about a 45-degree angle. Let your arms hang down in their natural position and pulls your elbows behind you using your upper back muscles to initiate the movement. Remember THE ROW IS NOT AN ARM EXERCISE. USE YOUR BACK! Do between 8-12 reps.
For the hips, as well as developing strength all over your body, one word will suffice: squat. To perform a squat, stand tall with your feet slightly wider than shoulder width. Keeping your chest up push your hips back and descend in between your legs. Be sure to keep your core tight and your chest up. Once you can perform 15 good body weight squats start doing them holding a dumbbell in front of you. Once you can do them with at least a 50 lb. dumbbell have someone show you how to do them with a barbell. I know a good trainer that can help. For good rotation a great exercise is the medicine ball chop. To perform it, hold a medicine ball in front of you in an even stance. Keeping good tall posture and your core tight, pivot on your foot and turn in the opposite direction. In other words pivot on your left foot to turn to your right. Be sure to drive the movement from your hip, not your waist or arms. 5. Conditioning. We all know that we have to have pretty good cardiovascular conditioning to play well. The question is: what is the best way to work on your conditioning for tennis? Well, to answer that, let’s think about how the sport is played. Player A hits the ball over the net. He waits while Player B either hits it back or not. If not, the point is over, there’s a short break and we start again. If Player B does hit it back, Player A quickly reacts, runs to the ball and tries to hit it back over the net and the cycle repeats. There are a few important things to note here. The first is that, for the most part, players only move for a few seconds at a time. The second is that most points last for maybe 20-30 seconds so having said that, your conditioning work should reflect these parameters. Doing 30 minutes on the treadmill isn’t going to develop the energy systems that are necessary to perform under these conditions and it’s going to make you slower on top of it. Your conditioning should consist of very high intensity work done for short periods of time but repeated. One example would be 5-6, four-second sprints with a 4-5 second rest between them. The key is to duplicate your energy demands and intensity as close to an actual game as you can. As I mentioned before, everyone has different strengths and weaknesses so what may be a priority for one person may not be for another. How to set up your program is also a very individual process. That being said, this list is a pretty good guide to some things you can work on that will help improve your game and keep you away from injuries. Please let me know if you have any questions. Have a great game!